Our time in Kenya so far has been one of contrast. Yesterday we drove through industrialized Nairobi on a new highway. Today we followed the road from Kijabe to Maai Maihiu which is dirt and pocked with potholes from the last rains. 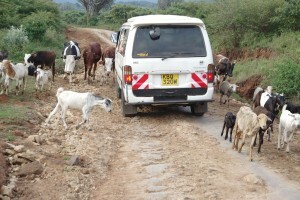 On the road we met both herds of cattle and goats as well as motorcycle taxies and trucks. Children on the road waved and smiled as we passed, unafraid of the moving vehicles. We spent the day sanding and painting the Rift Valley Fellowship’s church and home for street boys before coming back up the hill. Everyone helped, serving food and sharing during our meal. The Kenyans we worked with are very involved in their history and politics and the group learned a few new Swahili words to share with the children on the road back to Kijabe. Today we learned a lot about service. A Kenyan man’s cart lost a wheel in town and soon three other men came to help fix it. Another man cleared the tall grass and bushes on a well-traveled walking route to Maai Maihiu. We also learned how to properly peel mangoes and that, in Kenya, you don’t drive on the right or left hand side of the road, but on the best side. Mmmm, Mangoes are yummy. How is the food otherwise? What constitutes a typical dinner meal for the villagers? How is the weather?